As people age, hydrochloric acid secretion may be reduced, resulting in decreased levels of pepsin, which is needed to break down proteins into smaller, more easily absorbed substances. Without proper pepsin levels, the body has a difficult time digesting food. 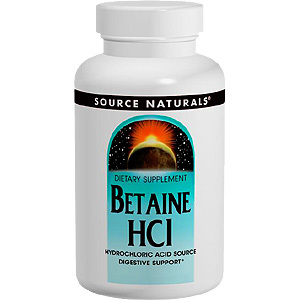 Betaine hydrochloride is a supplemental source of hydrochloric acid, which can be utilized by the stomach to produce pepsin. The combination of betaine hydrochloride and pepsin provide an excellent stomach tonic. HYPOALLERGENIC: contains no yeast, egg, gluten, soy or wheat. Contains no sugar, starch, salt, preservatives, or artificial color, flavor or fragrance. One tablet with a meal, up to four times daily. Do not take on an empty stomach. Warning: If you have stomach or duodenal ulcers, or are taking drugs that may cause ulcers, do not take this product. 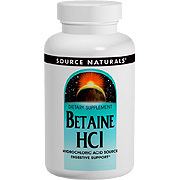 Betaine Hydrochloride 650 mg, Pepsin 1:3,000 165 mg.
Betaine HCL is shipped in a discrete, unmarked package. Orders are processed immediately and usually take about 3 to 5 working days to be received. We do ask that you try it for 2 to 3 weeks to feel the full effects. Any information received is used only for order processing and shipping purposes. Your information, such as e-mail address, will never be disclosed to a third party.